LINE ART CUTAWAY VIEW DONE IN ADOBE ILLUSTRATOR. 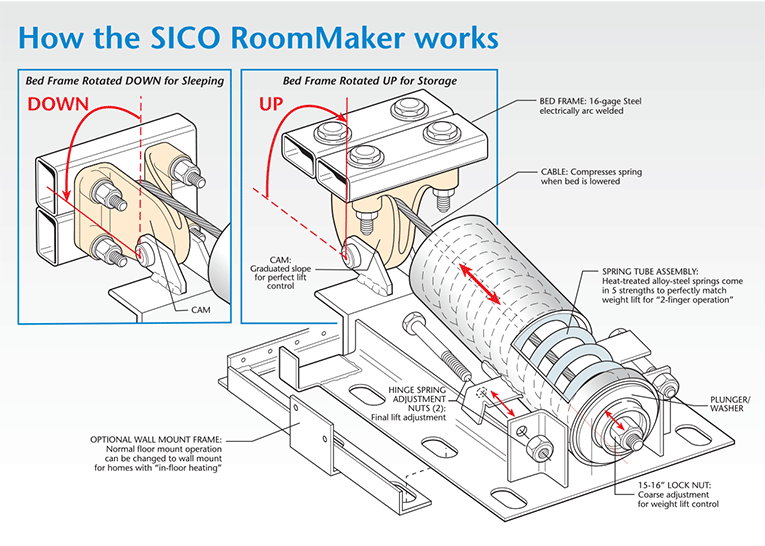 The SICO® RoomMaker mechanism is the battleship of the murphy bed world with it’s famous “Two-Finger Operation.” Compression Power Pack System — Bed comes equipped with 2 Powerpack/cam units that make it easy to raise and lower any size bed with the touch of a fingertip. The coil is compressed when the bed is lowered to the floor and expands back to its original position when the bed is stored in the upright position.